The last month was so busy with kids Term Exams. 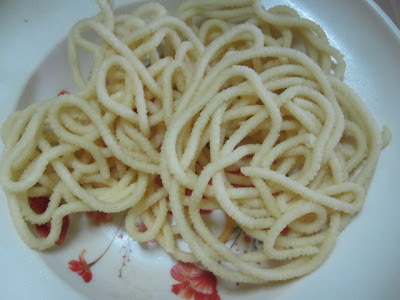 Murukku is one of the favorite snack at my home. Amma's pottukadalai (Dalia Split) Murrukku. Method to prepare: Wash and drain the rice. Shade dry the Rice for 1/2 hr. Dry roast the Urad dal to light brown. Allow it to cool. If you are using more quantity, you can get it ground in rice mil, else use your mixie to grind both Rice and Urad dal. First grind rice into a fine flour, keep it aside. then grind the urad dal to fine powder. In a wide vessel, take both the flours along with salt. Mix well. Add cumin, Sesame seeds to the flour, mix well. Whether you use Asafetida powder or the solid ones, you got to mix it in water, make sure it is dissolved before adding to the flour. If its not dissolved properly, when deep frying the muruku, there are chances for the hing to burst our due to air bubbles. Mix in the hing to the flour and finally add the butter. Gather everything well and you will get more of a crumbling mixture. Now slowly add water and knead a dough which is little more softer than the puri dough. Heat a kadai with oil enough to deep fry. Once the oil is hot enough, simmer to low flame. Take the Muruku Aachu, wash and wipe it clean. Then divide the dough into equal balls. Fill the Muruku maker with the dough. You can either press it directly over the flames or press over a paper and gently slide it down the hot oil. But since the quantity mentioned here is less, you can press it directly over the kadai. Cook over medium flame, using a slotted spoon, turn it over to other side to ensure both sides turn golden colour. Thank you so much Valli for making us to face lot of challenges. I am looking forward for the next month Challenge. I am landing after a long time. How r u Kamala? R u settled down? 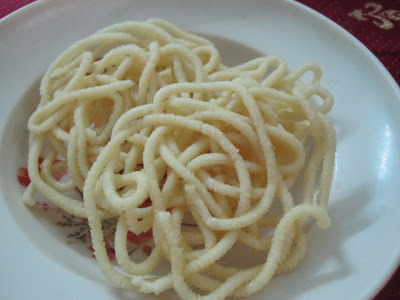 Missed all ur dishes from scratch... Crunchy and perfect color for murruku! Are you owning/writing in both blogs ? Perfectly turned out aren't these? Just yummy!! Lovely murukku Kamala! Nice to read your post after some time. Hope u and the kids are doing great! Expecting more posts now! Murukku has come out so. well.